On Saturday, it really felt like fall, and I wanted to do something to welcome the new season. 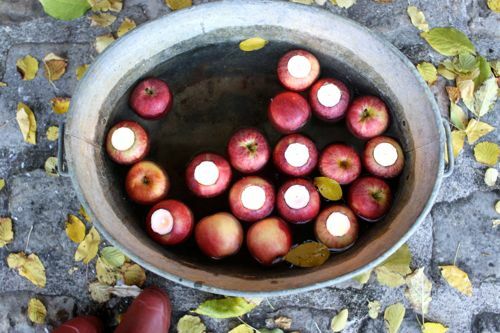 As we were working in the yard and clearing out windfall apples and pears I suddenly remembered: apple votives! They’re the first Martha Stewart project I ever tried (15 years ago this October). And they’re still one of my favorites. 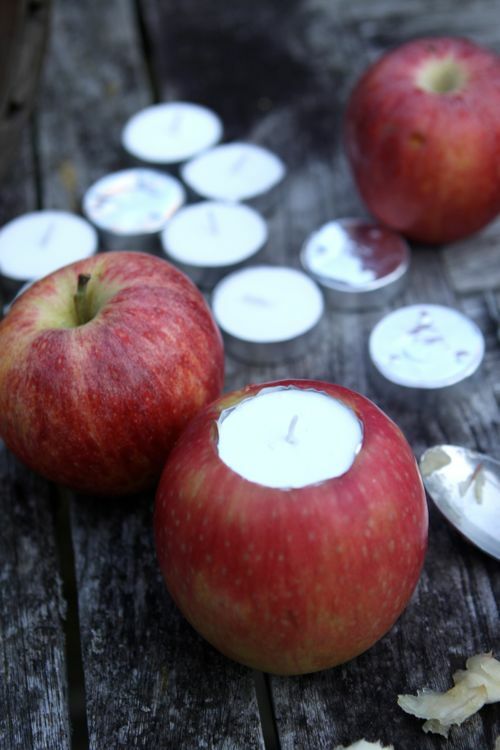 Making apple votives is super easy and doesn’t take much time at all. The finished display is so pretty and festive it makes for a really satisfying project. Gather supplies. 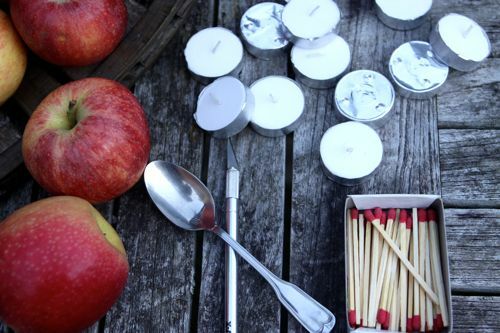 You’ll need apples, votive candles, a craft knife and a spoon. 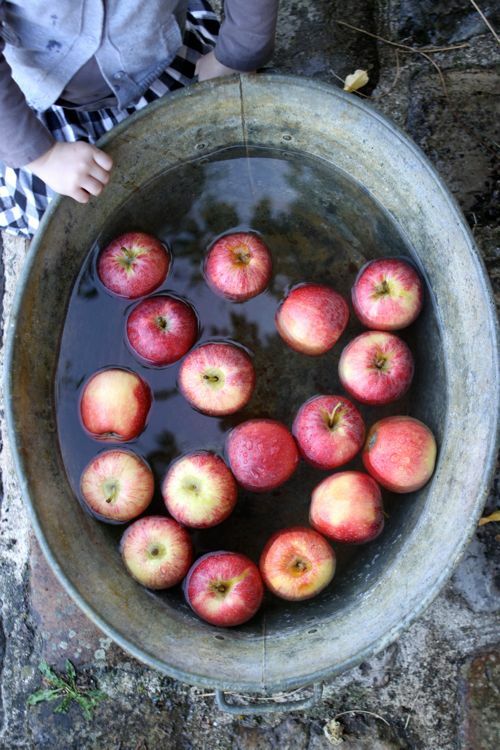 Start by floating all your apples in water. Some will float with their tops up, others won’t. 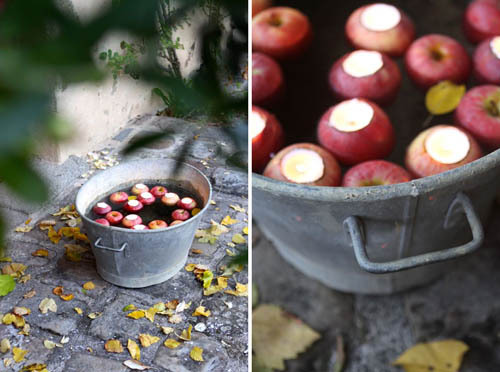 Pick a few of the top-facing apples for your votives. 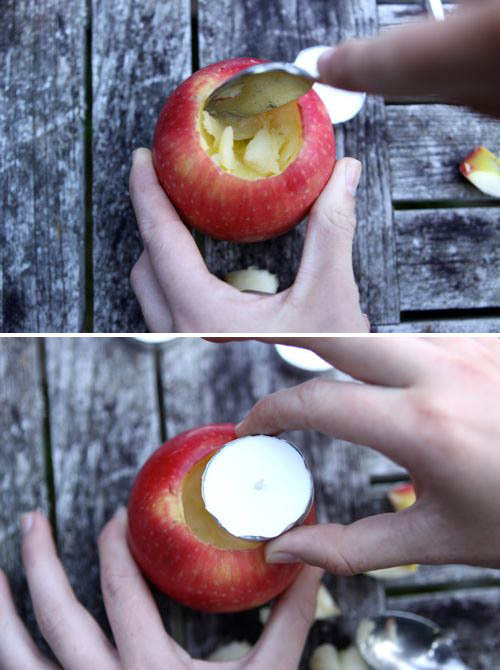 First, rest a votive on top of an apple and use the craft knife to trace around it. You’re just tracing, you don’t need to press hard. Second, move the votive and make straight cuts the depth of the craft knife all around the circle you traced. Try to cut straight down (it helps me to imagine the straight edge of the votive). Third, slice across your cut circle 3 times, as if cutting it into pie pieces. 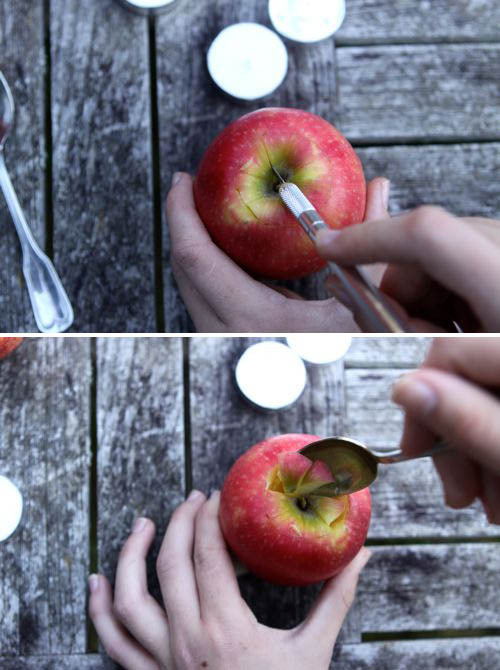 Fourth, use a small spoon to scoop out the apple pieces. They should come out easily. 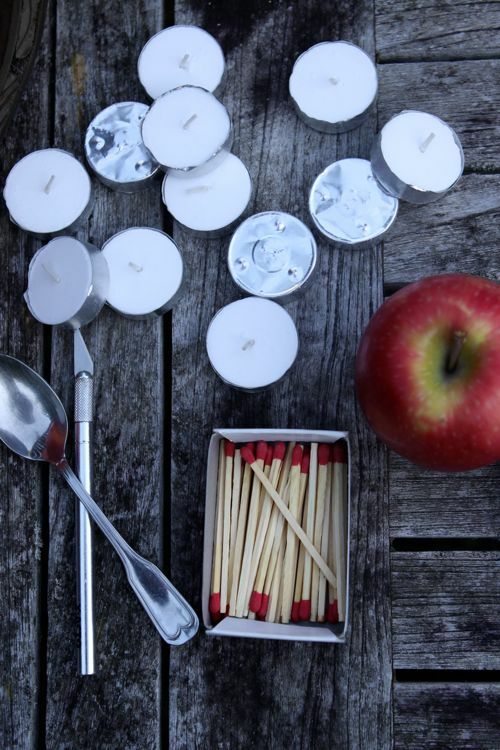 Fifth, after removing the apple pieces, your votive may slide right in, flush with the apple, but if it doesn’t quite fit, you can use the spoon to dig out a little more. 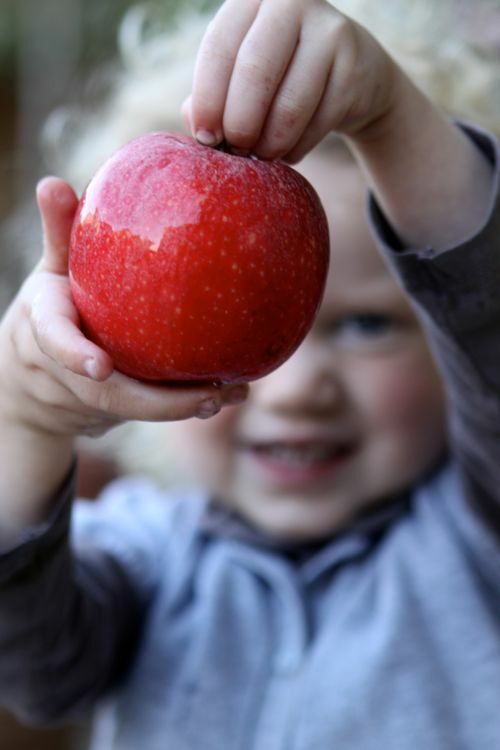 Last, place your votive in the apple. It’s ready to float and light! This is great idea. Could also be cute at Halloween for a bit of extra flickering light. Yes, yes! 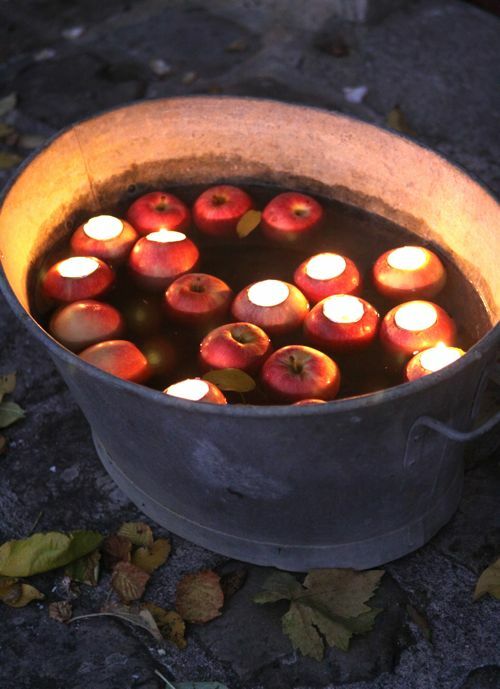 We’ve used apple votives as part of our Halloween decor and they are magical. 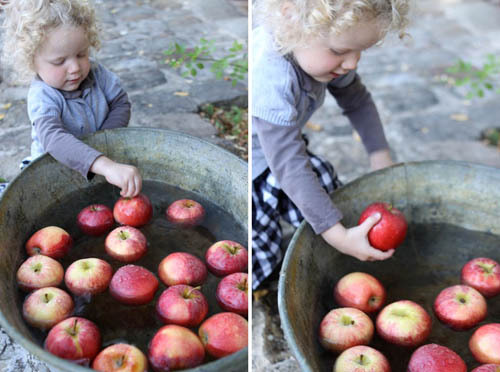 And there are always funny comments about “really adventurous bobbing for apples”. Love this DIY, I am so in the mood for fall!! This is such a perfect and simple DIY project for fall! Thanks for sharing. It looks beautiful! So gorgeous. Inspiring for a trunk or treat decorations! How long do these last? Could I make them a day ahead, and then light them the next night, or do they apples get too squishy? Great question, Kipin! 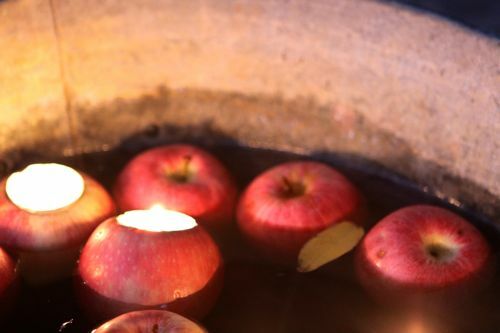 The exposed part of the apple (under the candle) will turn brown after an hour or so, the way apples do. 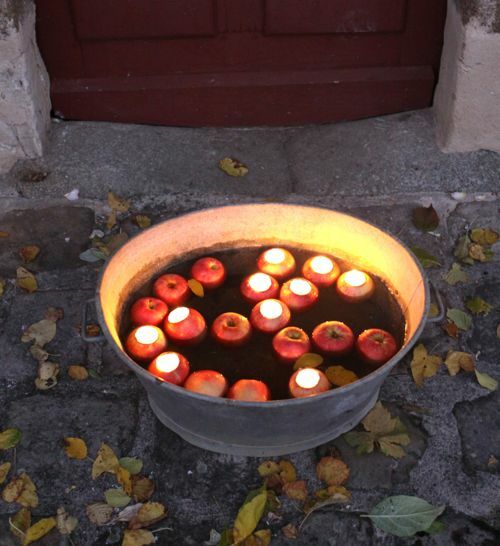 But, since the candle covers and hides the brown, the apples still look quite good, even on the second day. So I would say yes: you can prepare them a day ahead. But I wouldn’t do more than a day. 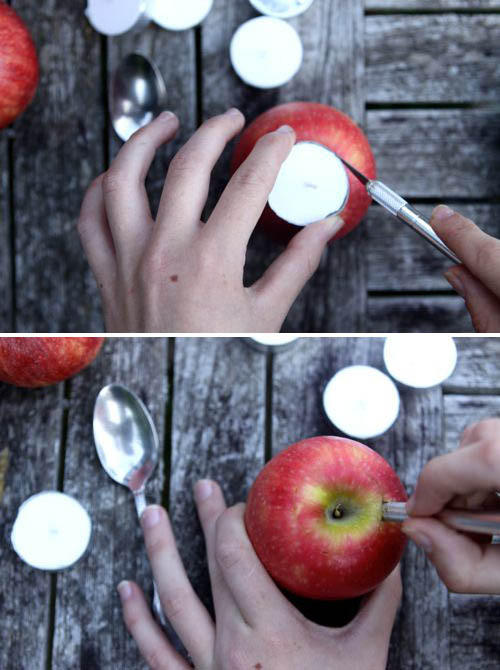 What a great idea for all the extra apples we have around. And you have me trying to remember what my first Martha Stewart project was! Yes! 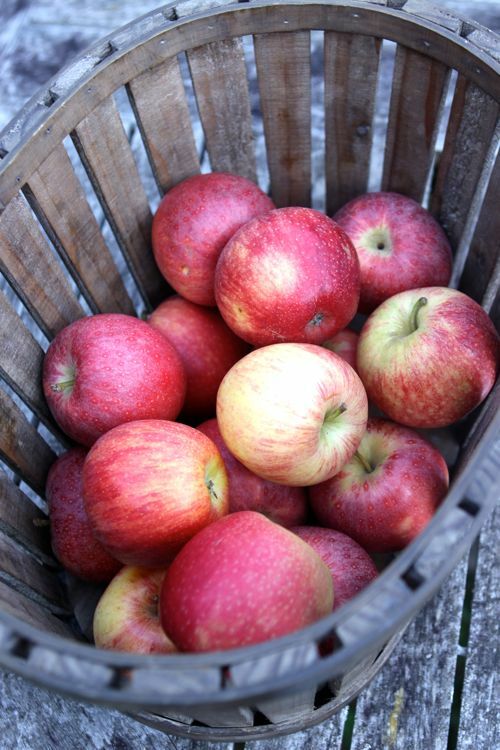 It’s an especially good project if you have access to a neighbor with an apple tree. 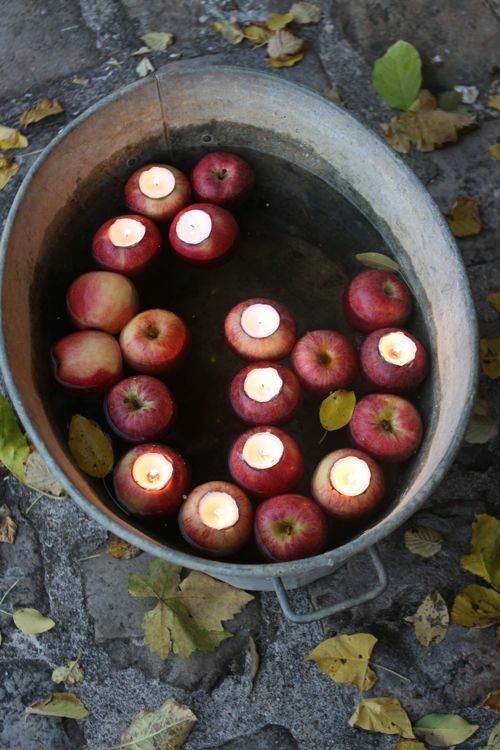 Windfall apples that are too bumped up to eat will do just fine as apple votives. This is such a lovely post! I’m in an apple mood this week, and we just had a yummy apple crisp this evening. I love fruit crisps and crumbles! I made one with plums and wild blackberries last Saturday and ate half the pan. Not even kidding. Ohhhhh, I actually saw a this little tool that does the carving in fruit/etc. for the votives in a store just this past weekend. Pic in link below, but I saw it at the Fireworks store in Seattle. lovely for an autumn dinner party! For sure! Such a fun greeting at the door. We use to do this at the 6th of December, when we celebrate St. Nikolaus, for a table decor. It’s so simple, beautiful and pure. Os felicito por la idea! May we have permission to pin this post on Pinterest? or did you already pin it so we can re-pin it? These are beautiful, as are the photos! Great idea. These are such an elegant decor idea and I love that they can work for any time throughout the fall. I shared with my readers here: http://seektobemerry.blogspot.com/2013/10/have-colorful-weekend.html Thanks for the inspiration!!! 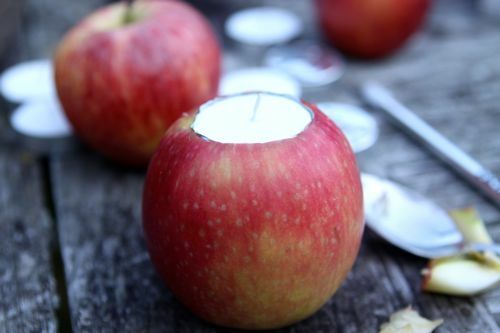 How to Make Apple Votive Candles | Your Blog For The Best Pregnancy Video's, Tips, How To Get Pregnant Fast Online, Everything Pregnancy! Very good idea for an autumn dinner party! Awesome DIY for fall, these look super easy and they are so festive! Do you think this would work with the 2″-3″ votive candles? I was thinking this might be a cool decoration at my Fall wedding next year.